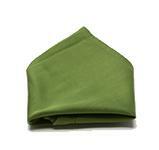 For a polished or formal look it's still useful to know how to fold a handkerchief properly. You want it to sit smartly in your jacket pocket, ready to be whipped out at the appropriate moment of gallantry, or when a sneeze is imminent. 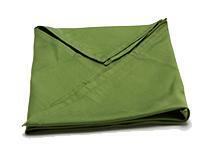 The Presidential, also called the Straight fold, is considered the simplest fold, best for smaller pieces. 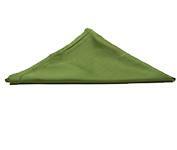 There is more than one way to achieve this fold, but the result will be a straight horizontal portion of the handkerchief showing at the top of the breast pocket. 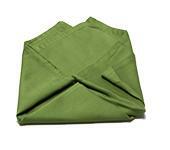 For this fold you will fold the handkerchief at right angles to fit it into the pocket. 1. 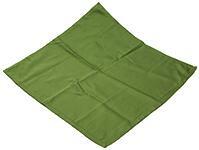 Select any handkerchief style that you like, then lay it on a flat surface to achieve the best folding results. When you lay it down it should be in a square shape, not a diagonal. 2. 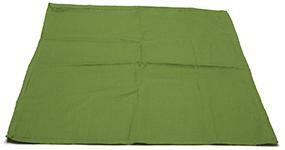 Fold the cloth in half from the side, so it is looks like a vertical rectangle. Then fold it again so it is in a square. 4. Flip the handkerchief around so the folds aren't visible, and make sure your completed fold is free of any creases or wrinkles before being placed inside your breast pocket. 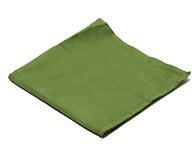 This is the standard fold you will see on men's handkerchiefs. It is a conservative style similar to the Presidential except that it is folded diagonally and the point is placed inside the pocket. 1. Lay your handerkerchief on a flat surface for accuracy. For this particular fold, it will start at a diagonal. 2. To create the beginnings of the TV fold, you should bring the bottom up to the top. Smooth the edges for an expert look. 3. Focus on the left and right sides next by bringing the left side over to the right. As you embark on this step, make sure the bottom is aligned with the first fold you made. 4. The right point should be brought directly to the center section, lighty touching the left side. 5. Your completed TV fold should be placed in you breast pocket with the heavily folded section facing in towards your chest. 6. 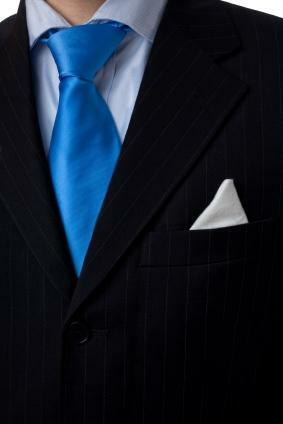 Finally, the top section should be folded in back of your pocket square, leaving a straight tip visible. For this fold, the handkerchief is also folded diagonally, but is tucked in the pocket so that the point is showing. 1. This is a basic fold, so it should first be folded in half; bringing one edge over to the next. 2. Next, take a selected corner (left or right) about a third of the way over to the middle. Fold in at a downard angle so the bottom edges are aligned. 3. The remaining corner should also be brought to the middle. Once folded in the bottom portion should have a rectangular shape. 4. 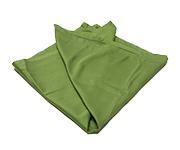 Turn the handkerchief around so that it does not show the folds. 5. Slide the finished fold into your breast pocket with the point shown at the top. 1. Begin by laying the handkerchief flat in a diamond shape as with the one point fold. 2. Bring the bottom half upwards, but instead of bringing the points up to meet, fold the handkerchief off center so that the points don't completely overlap. 3. 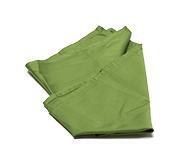 Fold each side in and tuck the handkerchief into your pocket with the two points showing. 1. Fold the left side up and across at a diagonal. (Now you should see the three points at the top). 2. Bring the right side in and down so it creates a straight edge and tuck into the pocket. 1. Instead of folding the right side in and down, you will fold it up and across. 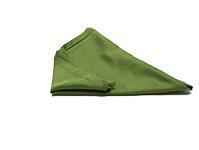 The bottom of the handkerchief will resemble a 'cone' shape. 2. Place it in your pocket with the majority of the handkerchief inside, so the result that will be shown is a series of four even points. If you wear many good suits and like to look sharp, you may want to explore more variants in how to fold a handkerchief. For most of these, you can certainly teach yourself, but you might ask the advice of a salesman in a high-end men's clothing store too. That way, you can be sure you're performing the fold correctly. Cagney: Named for the great James Cagney, of course, this is nothing more than a backwards version of the four-point, as well as a great excuse to watch some Cagney films. Astaire: It's hardly surprising that one of the most stylish men in old movie musicals got a fold named after him. Used for a pocket square, this is a puff with a point on either side. Straight Shell: Here, the handkerchief is pleated before you fold it over, thus making it look like nested shells. 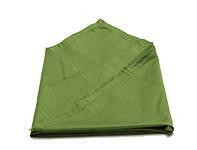 Diagonal Shell: The same theory and general effect, but the handkerchief is pleated diagonally before folding. How to Fold a Pocket Square - offers in-depth instructions to a classic folding method in a quick amount of time. How to Fold a Pocket Handkerchief - Part 1: The Pocket Square - part one of the two-part series that simply shows the basics of folding. How to Fold a Pocket Handkerchief - Part 2: The Formal Point and The Puff - part two of the two-part series that shows you how to do the specific folds, The Formal Point and The Puff. There is a difference between a pocket square and a pocket handkerchief, although the terms are often used interchangeably. A true handkerchief is usually made of linen or white cotton and they tend to be crisper and stiffer, making them ideal for well-defined decorative lines. They also have sharper corners to better accentuate the points when folded. 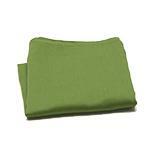 A pocket square can be made of a range of materials, including silk, silk blends, cashmere or wool. The result is a softer accessory, usually more pleasant on the nose, and a different look in the jacket. 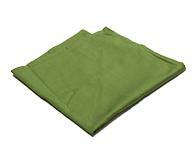 A square will usually be folded into more of a puff, sometimes called a Cooper. These days, men incorporate squares and handkerchiefs into their suits for the simple reason that it's elegant and adds interest to what otherwise might be an overly dark, plain look. Aside from decoration, they also serve the same purpose as tissues. However, why carry around a pack of disposable tissues when you can wipe your hands, remove smudges and dab away sweat in style.